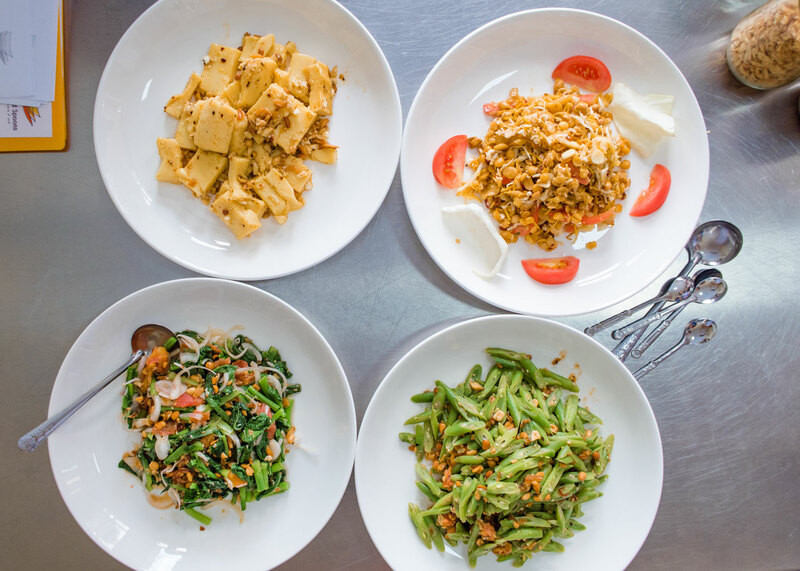 While visiting our friends in Myanmar, we had the opportunity to take a vegan, traditional Shan style cooking class with Three Good Spoons in Yangon. Our friend, Bre, had done work with them in the past and was passionate about their mission. Three Good Spoons is a non-profit organization that supports domestic workers at home and overseas who are vulnerable to exploitation and abuse. By learning improved skills in the kitchen and having a better understanding of hygiene and nutrition, which Three Good Spoons teaches them, they build confidence and improve their livelihood within Myanmar. The vulnerability of domestic workers was not something Andrew and I were aware of before this class. As two people who strive to have the best work-life for ourselves, we are humbled and 100% in support of helping Three Good Spoons and organizations similar to it. Taking classes, buying material goods or staying at hotels that lift people and the world up will forever be key parts of our travel plans moving forward. Below is a video overview of the class, and a review of the dishes and experience! It was truly a joy to learn from a Shan chef. Although this class was less hands-on than other cooking classes we’ve taken, it made sense because the Shan dishes were not overly complicated. It was more important in this class that we watch all of the ingredients the chef was putting together that make Shan dishes unique, and be able to ask questions about them. In addition, they brought us into the cooking process when it was most important – like stirring the Chickpea Tofu or Sago Pudding to understand how thick they needed Tofu to be before we took them off of the heat. None of the dishes were too complicated, and we encourage you to look them up and make a few on your own. We will also be making our own versions and posting them to the site over the following months. You will not be disappointed learning this new cuisine!